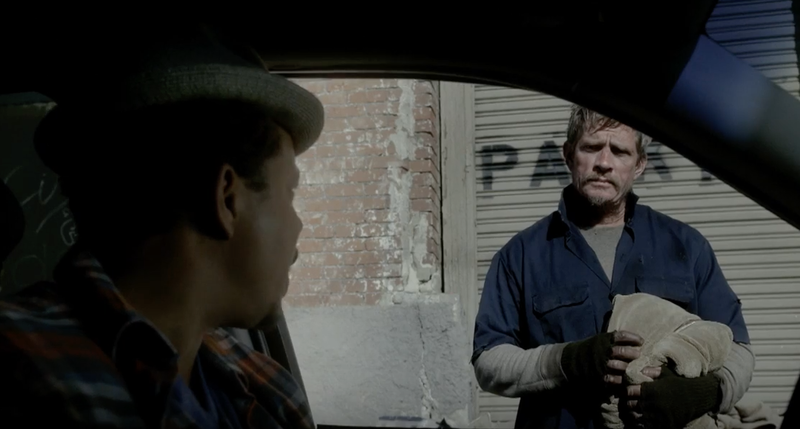 Willie (Church) is a homeless man who sleeps in a cardboard box at night, and who wanders the streets by day looking for food wherever he can find it (even if it’s not exactly fresh), and hoping to score money from passersby. He lives a lonely existence, keeping himself to himself and spending a considerable amount of his “downtime” on a rooftop that affords him a panoramic view of the city where he lives. Down at ground level, home is a place on a back street with a group of other homeless people. Willie doesn’t engage with other people. He keeps himself to himself, and tries not to get in anybody else’s way, including a local man (Clark) who carries a skillet and threatens to hurt anyone in the homeless group who aggravates him. Fortunately, while his approach to the group is antagonistic, there’s a taxi driver everyone calls The Pope (Howard) who is supportive; he provides blankets and food when he can. Willie and The Pope have a grudging respect for each other, but there are also clear boundaries that The Pope keeps in place. One day, Willie finds a little girl’s diary in a rubbish container. It’s burnt around the edges, like the other stuff there, but curious, he begins to read it. He learns at the beginning that the little girl has started the diary after her mother has died. Finding himself affected by her story he attempts to continue reading it, but is defeated by its being in cursive (basically joined-up writing). He begins to ask others in the homeless group if they’ll read it for him but he’s rebuffed at every turn. It’s not until he helps a war veteran, a man named Pinky (Holbrook), that he finds someone willing to read the rest of the diary to him (though he does learn to read cursive as well). If there’s one thing that tales of the down-and-out and the dispossessed always do, is to inform the viewer just why the main character(s) are down-and-out or dispossessed. It’s like a courtesy feature. Here’s a man (or a woman) who’s down on their luck, and here’s the reason why. Except in Cardboard Boxer, the viewer has to make his or her own mind up about why Willie is homeless, and it’s not an easy thing to decipher, because writer/director Knate Lee isn’t about to tell you. That said, it’s not too diffcult, given Willie’s skill as a fighter – well, brawler might be a better term – that his slow-witted nature could have been caused by one too many blows to the head, but even that interpretation lacks confirmation. Here, Willie is extra handy with his fists, and that’s all you need to know. Except it really isn’t. Willie isn’t exactly an ordinary character, despite his doing ordinary stuff and trying to fit in as an ordinary human being, his emotional attachment to a war veteran whose legs are missing below each knee, and a little girl whose name he doesn’t even know show a need to connect, and it surprises him as much as it does us. But as he works his way through the diary, and begins to express his need for human contact, Willie doesn’t become any more sympathetic, or any more likeable. This is someone who’ll batter a fellow homeless person for money and the apparent “respect” of a young man well over twenty years his junior. And he’s not looking to find a way out of his “predicament”. 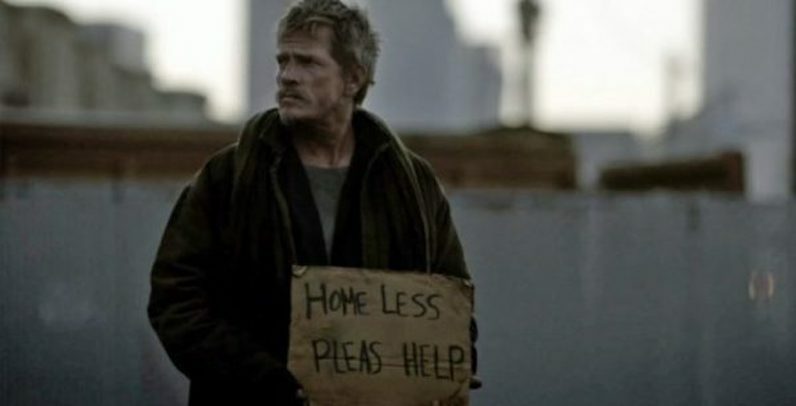 Instead, and despite sums of money coming his way that could begin to make a difference, Willie shows no sign of wanting to improve his life, even when he has enough money to do so. Sure, he rents a hotel room and takes a shower and eats snacks while watching TV, but this is literally the best that he can come up with. His life literally doesn’t get any better than that. And so, the movie falls back on the little girl’s diary, with Knate Lee’s script painting a picture of abuse and despair that compliments Willie’s own life – or at least it would do if we ever knew what caused his fall through the cracks of society in the first place. In the end, Lee’s script is a bleak portrait of a disconnected man’s empty life and his belated attempts to give it meaning, even if his methods – fighting for money, treating his fellow down-and-outs with disrespect, latching onto a possibly dead girl’s memory – aren’t exactly forgivable. It all makes for a dour, miserable movie that relies too heavily on Church’s distracted, almost there performance, and which features way too many shots of Willie standing on his favourite rooftop, or on a street corner, or just trudging round the city aimlessly. His life lacks purpose, but that’s an easy call; unfortunately, writer/director Lee feels the need to remind us of this constantly. Take away all those “blank stare” moments and the movie would run at least twenty minutes shorter. Despite being on board as an executive producer, Church’s involvement doesn’t do anything to elevate or improve the material, and he does little to convince the viewer that there’s an interior life going on behind the placid-featured façade he adopts for the most part. Howard is stuck with a supporting role that probably didn’t require him to be on set for more than a few days, while Holbrook’s turn as the disabled war veteran Pinky is yet another in a long line of indistinguishable disabled roles that movie makers believe audiences still have a lot of time for. And as for Wakefield, well, JJ is a caricature role that follows a predictable arc that’s married to a predictable portrayal. The movie has been shot in a nondescript, visually unappealing style by Peter Holland that is no doubt meant to be a reflection of the lack of glamour inherent in Willie’s life, but it’s too obvious a choice and feels like a better effort couldn’t be decided on or made. 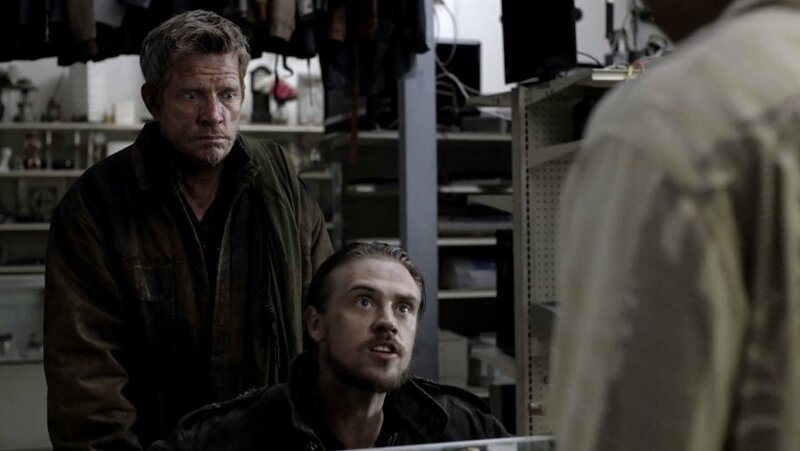 And under Lee’s guidance, Jeff Seibenick’s editing leaves several scenes feeling as if there should be more to them, or in a weird contradiction, that they should be shorter and more punchy – but the material won’t allow it. This is Lee’s feature debut, and it shows, the choices he makes as a director showing a lack of imagination and confidence. And this is borne out by the movie’s conclusion, a fairytale ending that is both unnecessarily mawkish and dramatically inept given what’s gone before. But at least it’s not as downbeat as the rest of the movie. 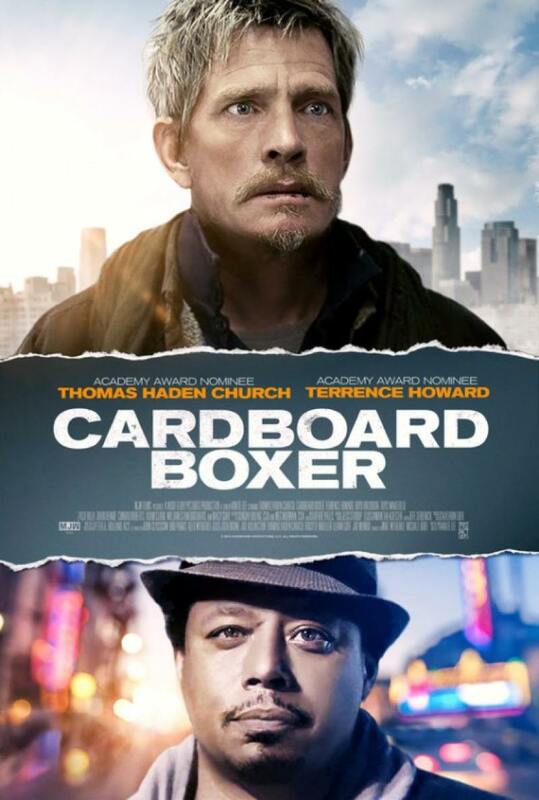 Rating: 4/10 – a lumbering attempt to find grace and purpose even amongst homeless people, Cardboard Boxer lacks depth and a sense of purpose, and a central character the audience can get behind; while it merrily (and that’s still not the best word) goes about telling its largely redundant, determinedly non-complex tale, viewers will be wondering when and if the movie’s ever going to grow and stretch into something more affecting and worthwhile.